Slip into a vibrant Japanese Kimono each morning. 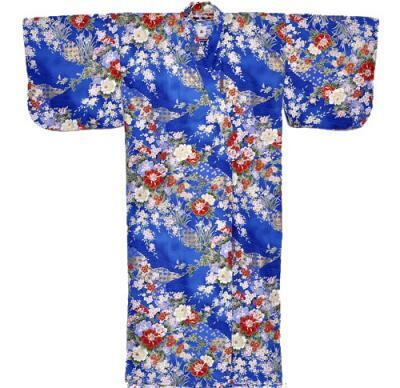 This stylish women's kimono is made of luxurious 100% cotton sateen. "Hanu" is the Japanese word for flower and the delicate blooms are layered in natural shades of pink, red, yellow and purple against a rich ocean blue background. Finished with soft swirls and accents of gold to bring depth and classic style to the design. This Kimono has the traditional butterfly sleeves and includes a matching belt. This women's kimono is available in two sizes: S/M and XL/Wide. S/M, measures 55" in length and is designed to fit a woman 5' 5" to 5' 9" in height. The sleeve length measures 14", the shoulder width is 24" and the girth is 45". If you are looking for a shorter kimono, please see our selection of Happi Coats. Once I put this on, I didn't want to take it off. It is so soft and pretty. I couldn't be happier.